Govind S Srivastava - meherbabatravels jimdo page! The following is a personal account. G.S.SRIVASTAVA was a senior officer in U.P. State Government. He liked saints and paid obeisance to them. Some one told him about Meher Baba who was in search of Masts. 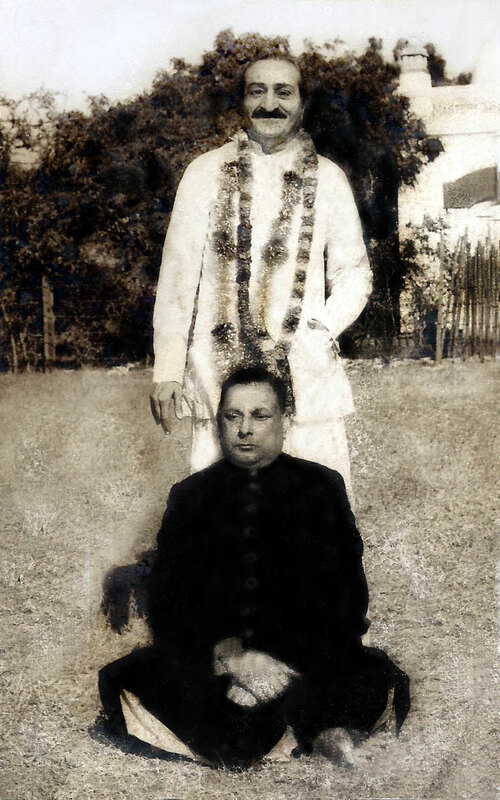 In 1943 G.S.Srivastava met Baba for the first time. Baba embraced him with such intimacy that he felt like meeting his own elder brother. Baba knew of his feelings and maintained this relationship throughout. For G.S.Srivastava, Baba became the head of his family and he consulted Baba in all his family matters and followed his behest. G.S.Srivastava was one of the close devotes who was particularly called by Baba at every occasion. Once being in a queue for Baba’s darshan, Baba detained him for a few minutes to enquire about the well being of his family. The organisor managing the line of darshanites tried to rush him through, Baba looked tersely at him and embraced, G.S.Srivastava closely, giving the impression that G.S.Srivastava was special. Baba knew that G.S.Srivastava had a large family and it would be expensive for him to bring all all of them to Baba. So Baba decided to visit his home, take his lunch and spend the day with them. This was in 1954. There was a huge tree in front of G.S.Srivastava house, Baba sat there and distributed prasad. G.S.Srivastava's son had gone out to buy a film so Baba gave his share of prasad to G.S.Srivastava to be given to the son, inadvertently G.S.Srivastava ate that prasad. Baba scolded him and explained that a prasad is his benediction meant only for the person to whom it is given. When son returned , Baba took everyone of the family to the same tree and redistributed the prasad to each of them. Baba was so particular about the redemption of his near and dear ones. Another son of G.S.Sriwastava was about to marry a Christian girl whom he loved. The conservative family did not like it. With the result that the son contemplated committing suicide. While escorting Baba to the railway station, this young man was by his side , Baba looked intently at him and said “ you should live for God and die for God, no one is worth dying for except God. Remember this.” The message was clear for the son and the family , who relented. Eventually the son married that girl and still lives remembering Baba. Once is a gathering of close devotees G.S.Srivastava was wearing a very formal dress (SHERVANI) and CHURIDAR PYJAMA. Baba looked at him joked whether he wished to go to the parliament, why he so dressed, G.S.Srivastava said he is sitting , in the house of the LORD and in-front of HIM. In defence to the dignity of the occasion he dressed liked that. Baba was much amused by his witty remark. Baba used to banter with his old devotees and they too were quite informal with him although they loved and worshiped him as GOD. In July 1958 Baba had called his selected 180 close disciples and delivered his universal message. G.S.Srivastava was one of them. G.S.Srivastava daughter Saroj was of Marriageable age and Baba asked him as to what effort he was making, Baba slightly gave hint that He had already selected a suitable match for her and G.S.Srivastava should go and find him. Immediately after his return G.S.Sriwastava was transferred to Varanasi just for one month. He met my father through a common friend and came about me. He remembered Baba’s indication and put the marriage proposal before my father, who readily accepted it. It was considered preposterous to consult the boy or the girl, in those days. Thus we were married, without knowing each other or even having seen any photograph. This was how Baba’s wish was fulfilled. G.S.Srivastava was an honest officer but his superior was not. On some filititious ground he suspended G.S.Srivastava during the same period Baba was to pass through the city G.S.Srivastava was living, G.S.Srivastava was asked to bring lunch for Baba at the railway station, looking at the erstwhile face of G.S.Srivastava Baba asked and was told about his predicament. Baba asked him not to worry and assured that since he was passing through that area every devotee of his would be benefited. Surprisingly G.S.Srivastava was absolved of all the charges and reinstated with dignity, and simultaneously the said superior officer was transferred. All this happened with in week. Every three years in India, a huge religious fair known as the Kumbha Mela is held in succession at Hardwar, Allahabad, Nasik and Ujjain. This year the Kumbha Mela was scheduled to be held at Allahabad, and Baba expressed his wish to attend the gathering and touch the feet of seven thousand sadhus and the masts who would come. Just as other people's God is in idols and rituals, my God is in these masts. Whoever be your gods, either you yourselves or I, as your Master – masts are my gods. This mast work, which has been continued up to this day, will end before February 15th, 1942. To give a final touch to this work, I now wish to go to the Kumbha Mela. I have to contact seven thousand sadhus and the masts there. After I finish this work and return here, no more fasts – no more seclusions. Then there will be no gods for me. I will be alone, and with me, these mandali. To make all the necessary arrangements required for Baba's work, Pleader was sent to Allahabad ten days in advance. There he contacted a man named G. S. Srivastava. 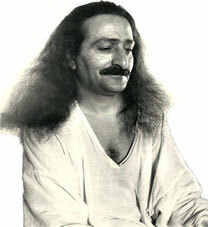 Srivastava was already planning to spread Meher Baba's message of love at the Kumbha Mela. Vibhuti and Babadas were coming to Allahabad for the same purpose. But Baba instructed that until his own work at the fair was over and he had left Allahabad, their work should not begin. The large painting done by Rano of Baba seated, titled "The Avatar," was to be sent to Srivastava to be displayed at his house during the Kumbhla Mela. But Baba specified that the painting should not reach Srivastava until after he had left Allahabad. Immediately after Baba's decision to go to Allahabad was announced, Maya seemed to cause its usual opposition. The government of India cancelled all special trains to Allahabad on account of military requirements. Even the number of trains was reduced, as were also the number of carriages in the remaining trains. Baba left Meherabad early in the morning on December 29th, and went to the train station, accompanied by Baidul, Eruch, Chhagan, Gustadji, Kaka, Pendu and Savak. At the station they were informed that the tracks were blocked by special army troop trains and it was not known when the Allahabad train would arrive. To avoid a long delay, Baba therefore decided to travel to Manmad by bus, which Sarosh provided. G. S. Srivastava and family were old Baba lovers from Allahabad. Baba paid a surprise visit to them one day, to their utter amazement and joy. (His presence in Allahabad was a secret.) They all ran to him – Srivastava's wife, mother, three daughters and son – and it was an amusing sight, as Srivastava was a rather rotund figure and usually did not run anywhere. Baba stopped where he was until Srivastava caught up. He was breathless, and embracing him lovingly, Baba joked, "You run quite fast!" He then addressed the family in a serious tone, "Think, it is my love for you that has brought me from such a great distance to see you all. Have you any idea of my love?" Ironically, the family had been talking among themselves about Baba's programs in the Central Provinces, and Saroj (one of the daughters) had bitterly remarked, "Baba is giving darshan to thousands; it is our misfortune that we are deprived of it." Baba told them, "You are all so lucky that I have come to your house. One day, you will realize it." Baba then returned to his place, where he amended his plans. He was to have remained in Allahabad for ten days, but since he finished his work there on January 10th, he thought of going to other places to contact masts before resuming giving mass darshans. Calcutta and Hyderabad were discussed, but in the end, Madras was selected. The mandali began making arrangements to depart.